Jenny Jetset welcomes you aboard Bingo Jetset but sadly you won't be seated in First Class at this site if you are looking for something a little different from your online gaming experience. The brand is part of the Dragonfish network powered by the 888/Globalcom software. Of course that isn't a bad thing, we've simply seen it from numerous other brands on the Internet already. The home page is quite bland with limited information about what the brand has to offer. The main focus of the landing page is how to claim your 100% first deposit bonus but makes no mention of the fact that you can play bingo for free without even making a deposit. New players to the site are able to access one free room from 7am until 7pm daily. Free Bingo All offers 90 ball games for £1 jackpots every eight minutes. It will take you just a couple of minutes to register an account with Bingo Jetset and then you can login and visit the lobby to see exactly what the site has to offer by way of bingo and instant win games. At the time of the review only 75 ball (pattern and multiline) and 90 ball bingo games were available. 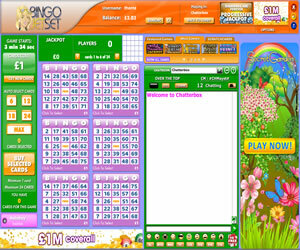 Enter any of the bingo rooms and you will find the layout make be more than a little familiar to you unless you are a novice to the world of online bingo. Your bingo cards are in the middle of the screen with your purchasing options to the left (becomes call board when a game is in play) and your chat room to the right. The chat rooms is where you can participate in the social aspect of the site along with winning loyalty points by participating in the chat games. Promotions from Bingo Jetset are limited to the standard Dragonfish network offerings so this brand does little to stand out from the crowd. Having said that, if you like the 888/Globalcom software, you will feel right at home aboard Bingo Jetset. 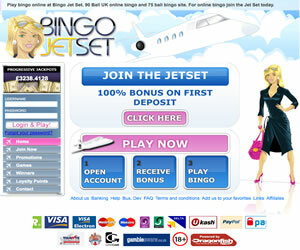 Bingo Jetset offers three variants of the bingo game at their site. Most games are either 75 ball pattern or 90 ball bingo but there are rooms that offer 75 ball five-line games too. You will find a selection of instant win games like slots, scratchcards and table games available, some of which can be played in the same room as your bingo. Wagering requirements at Bingo Jetset are 4x the amount of deposit and bonus but you can withdraw prior to meeting these requirements. However, should you not have met the wagering then your bonus money in your account at the time of withdrawal will be lost. Before you can withdraw you must have deposited at least £30 into your account.